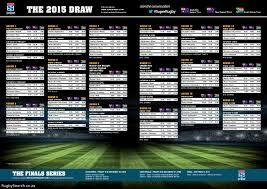 Below you see the Super Rugby schedule for 2015. 21 rounds, 21 weeks, with no other tournament getting in the way. Could this be a better blueprint for European rugby than the UEFA Champions League? If you’re a rugby fan in the northern hemisphere, there are several different ways to know it’s June. No summer tours this year it’s true, but there is still the Under 20s World Championship, there’s also the field in the French championship whittled down from 14 to 4 after just the 10 months, and of course the biggest tell of all - me harping on the need for a world rugby calendar that finally make some sense. And when I say "world rugby calendar", I don't mean 12 photos featuring the bare backsides of top players across the globe for ladies to pin up on their walls, just so we're clear! I actually mean the overall structure of the season, particularly that in Europe which was built on foundations from the amateur era and in my humble opinion requires complete demolition and restructuring. Had I written this piece a week ago, you’d probably see a paragraph at this point where I’d say something like : “I know I’m wasting my time looking for change … I may as well ask for Sepp Blatter to resign as FIFA chief!” So now it seems that anything is actually possible, maybe it’s worth another rant after all. For me, the current schedule is the cause of many other problems in the game, each of which have been “fixed” in other ways, thus pulling up weeds by the leaves rather than the roots. Let me offer a topical example...the new Pro12 European qualification system. Of course cutting the qualifiers from 11 to 7 was better for the league and made for more exciting matches in the latter rounds of the season. But I’m wondering if perhaps we’re over-stating this point a tad? Does this mean the garden is rosy for the league now and its future is guaranteed? I’m not so sure. We’re still talking about a season that runs from the beginning of September to the end of May - 38 weeks for a competition that takes just 24 matches to win. While I firmly believe (and have already said on this site) that Glasgow were worthy champions this season, I still have my doubts as to whether the stop-start nature of a campaign which includes fixtures on test weekends is the ideal way to find the best team out of 12 rugby clubs. Also when we look at the Pro12 in particular we’re talking about clubs from 4 separate unions each with their own views on handling their squads, so any hope of having a level playing field (surely a primary goal when putting together a tournament in any sport) goes out the window before a ball is even kicked. Before I bemoan the status quo any further I probably should outline what I’d like to see. My utopian pro rugby world would involve a compromise calendar which has the two hemispheres' top competitions running side-by-side as closely as possible. And here in Europe we would need to take the extra step of running our competitions in “blocks”, ie playing from start to completion before another one begins. One of the biggest features of this would be fixed windows for test rugby which would make it easier for players to choose where to ply their provincial trade without their home unions holding too many fears about their availability for internationals, thus reducing the need for anything like a "Giteau Law". Just one possible way of doing this would be to have the Champions Cup/Challenge Cups start the season and played to a finish, then we could have the Six Nations and finally the Pro12/Premiership/Top14 could round off the campaign with European qualification for the following season on the line as normal. To facilitate this change I reckon we’d need to take about four rounds from the domestic leagues and add them to Europe (eg 18 not 22 rounds in Pro12 and 10 not 6 in RCC). But as I always say when I harp on this, what you see above is just a suggestion. There are of course those far more qualified than I to come up with the particulars. I'd be happy with some kind of consensus for change in the wider sport. My overall point is that the way things are set up now, the pinnacle of the European domestic season, ie the Champions Cup, is chopped up and scattered throughout the season and this, for me anyway, goes against what pro rugby is meant to be about. Just imagine if the tournament could be played over a tight 12-14 week schedule during which the best provincial coaches on the continent all knew they had their full complement of players together for the duration? As opposed to what we have now, where they drag their squads through 6 qualifying matches spread over 4 months before resorting to prayer in the hope that none of their stars get injured in the Six Nations before the knockout phase? And why do we accept this current set up? Well personally I think it’s because for all the lengths to which we rugby fans go to show how different our own beautiful game is to soccer, we still think that scattering multiple tournaments across the season is “ok” simply because that’s what UEFA do. I’m not exactly privy to what footballers need to do to prepare for matches and I’d say it does tend to get complicated at times, but I doubt it comes even close to what rugby players have on their plate. And surely a calendar that keeps squads together for longer has to benefit what we end up seeing on the pitch? Personally if I were to look for inspiration somewhere else, I’d lean towards an organization like SANZAR - far from perfect I know, but at least they’re involved with the same game and their top competitions are all run pretty much exclusively in blocks and every time their test squads come here for November series, they have already been together for at least two months, something our coaches can only dream about at the same time of the year. Now of course I know the current European deal is for eight years so it looks like I’ll be forced to keep this annual HarpinOnRugby rant tradition going for a while yet before there’s even a hope of anything being done about it. In the meantime we’ll continue to have the different unions doing their own thing to get around the clunky schedule...Ireland with central contracts and player management, England and France with their wiggle-room-filled salary caps, Wales with their, er, “lively public banter” between union, regions and clubs, Scotland and Italy doing their own thing with varied success, and with most of the money on this side of the planet, the southern hemisphere enforcing strict(ish) rules to keep their players at home.